Want to know what I consider the worst part of working out? Muscle strain and fatigued muscles. For people like me who have been out of shape and just getting back into the swing of things, a good workout can leave you sore for hours, if not days. What I have learned really helps when I have achy muscles is a hot bath, following by a good massage. Personally, I swear by my massaging cushion and love it, but the thing is bulky, heavy, and not the easiest thing to move around when you are already sore. I needed something smaller and compact for those times when I needed to deal with tense muscles or a slight headache. As I was researching different massagers, I found the perfect things – the HoMedics® 3D Shiatsu and Vibration Massage Pillow with Heat! 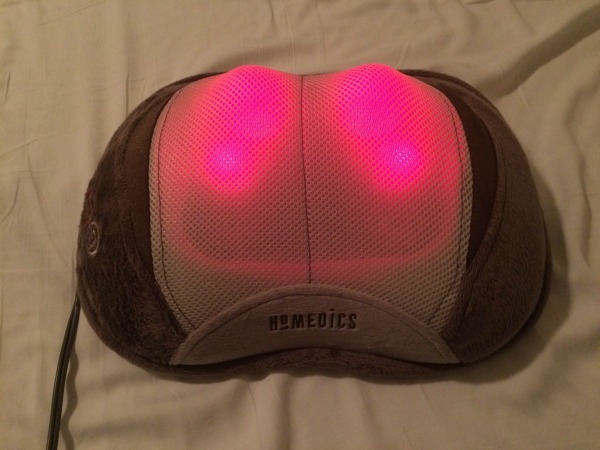 HoMedics® 3D Shiatsu and Vibration Massage Pillow with Heat: What is It? Looking for a way to deal with neck, back, or shoulder pain without having to go to an expensive masseuse? If so, we think you will love the HoMedics® 3D Shiatsu and Vibration Massage Pillow with Heat. This innovate massage pillow delivers a circular kneading massage and vibration to help loosen tight muscles. So, how exactly does it work? With the system’s 3D technology, it uses a circular kneading motion to give a you a more authentic, deep massage. For tired muscles, you can also use the built in heat to make your massage even better! Once you have tried this awesome pillow, you will never think of a home massage the same way again! 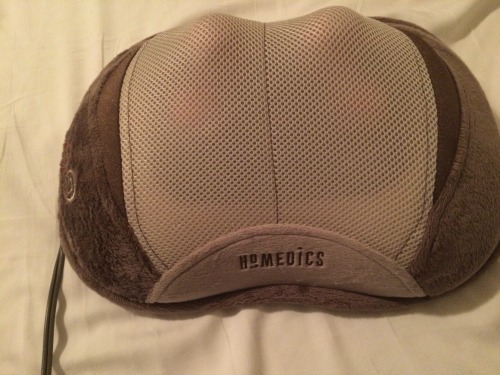 Having used HoMedics products before, I had very high expectations for this massage pillow. As I expected, it met my expectations and more. To put the massager to the test, I tried it out with a horrible headache caused my muscle tension. Within 15 minutes, using the kneading setting on my neck and shoulders, and my headache was gone. Best of all, my shoulders and neck both felt amazing. Since it is small, I can also use it in bed or while listening to music on the couch, making my massage experience even better. Based on my own experience, I am delighted to give the HoMedics® 3D Shiatsu and Vibration Massage Pillow with Heat an A rating. Want to purchase this wonderful pillow for yourself? 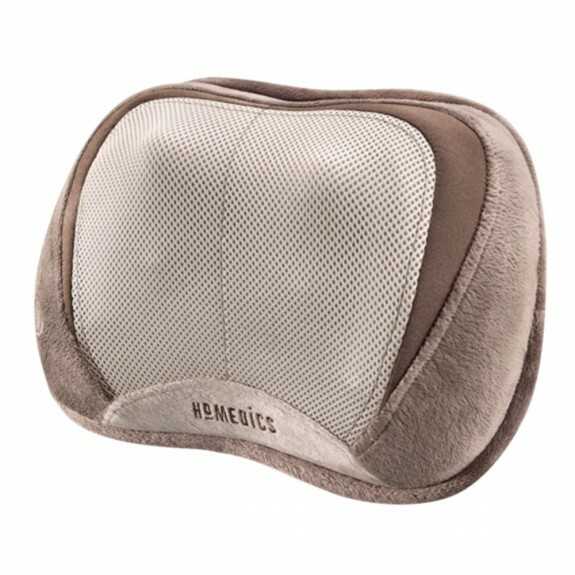 You can buy the HoMedics® 3D Shiatsu and Vibration Massage Pillow with Heat on Amazon.com for only $49.99. Find more HoMedics® deals & info on social media! I really have to check this out. Looks very relaxing. i would like to find a product that will work as you describe. i hope is win because buying one is not possible. I have allot of neck problems and headaches this would be amazing to own I want one. OMG!!! This is just what i need i always have headaches, and my neck and shoulder area is always hurting i have to consider getting this if i can afford it. Awesome! This is something I could really use. Looks very relaxing and calming. This looks awesome! It makes me wish I had it right now because I must have slept wrong last night and my neck is sore and tight today. This pillow sounds wonderful. I would like to try one, but I really don’t think it would something I could use. That sounds ideal. Right now I have a large heat massage chair pad. It’s great for a heat pad, but lacking in the massage area. It’s noisy too.